I am back from the swimming pool, I feel good, I feel light, I feel satisfied. I walk with a more confident step, lighter than usual, the swimming bag on my side holding me back with its weight, bringing me back to earth and, by contrast, making me appreciate more the lively dash I feel in my legs. I get into the car, turn on the radio and on the way back home I search for a song to inspire me, something cheerful, light, not to burden my mood but to put wings to my thoughts and my dreams. Everything I do brings me back to this word, a concept that goes far beyond its literal meaning: lightness. Vague memories from high school bring back from the mists of time the first chapter of Six Memos for the Next Millennium by Calvino*, Lightness. I’m not here to make a talk on Literature, it is not the place nor the time, and certainly I do not have skills to do that. It’s just a cue for reflection. Lightness is one of the goals I set for the blog, I’m not ashamed to say it: a light and fluent language (and how hard it is! I have the annoying tendency to stuff the speech with adjectives and subordinate, just as I do with a turkey), a minimal graphic layout, fresh feelings and sensations. I try to keep away the heaviness of daily life, I try to wear pink lenses to look at life with levity. This does not mean that I don’t have a clear perception of what reality is, I don’t deny difficulties. I simply respond with a smile and a pinch of optimism. It is not easy to remove burdens from heart and mind, but this is the method I have chosen to live my life with. Where can we find lightness? Basketball players who hover in the air to slum dunk as if gravity did not exist, the flutter of the heart when you’re in love, a poem depicting a dream in light colors, the caress of a child, a fruit mousse in summer, a dish of raw salmon with a few vegetables. It is essential to have the freshest salmon, since it is eaten raw, marinated only for a few minutes. 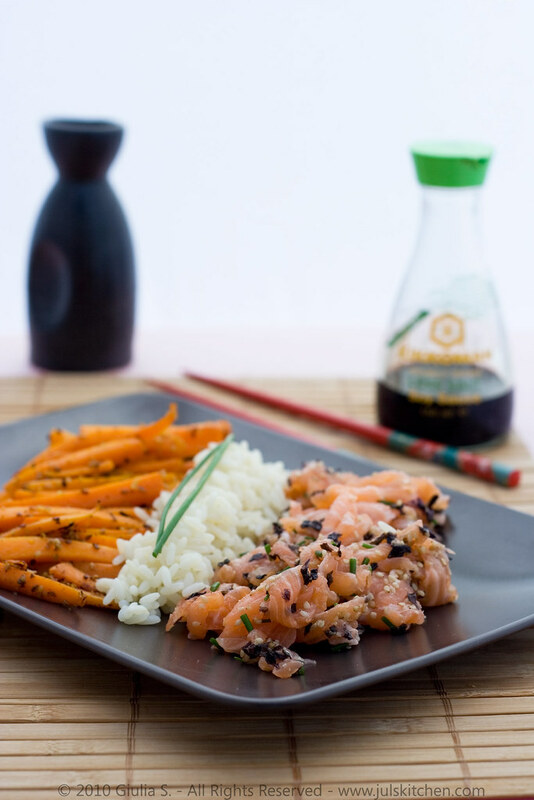 In a large dish lay the slices of salmon – whole or cut into strips – and season with a few tablespoons of soy sauce, a few flakes of Maldon salt for the crunchy side of life, a tablespoon of sesame seeds and a spoonful of nori seaweed flakes. Meanwhile, clean carrots and cut into strips about 5 mm thick. Blanch them in boiling salted water with two tablespoons of white vinegar. Cook for about 10 minutes, then drain the carrots. In a non stick pan, heat a tablespoon of olive oil with sesame seeds. Add the carrots, finely chopped chives, grated ginger and saute over high heat for a few minutes. Remove from heat and sprinkle the carrots with a few flakes of Maldon salt. 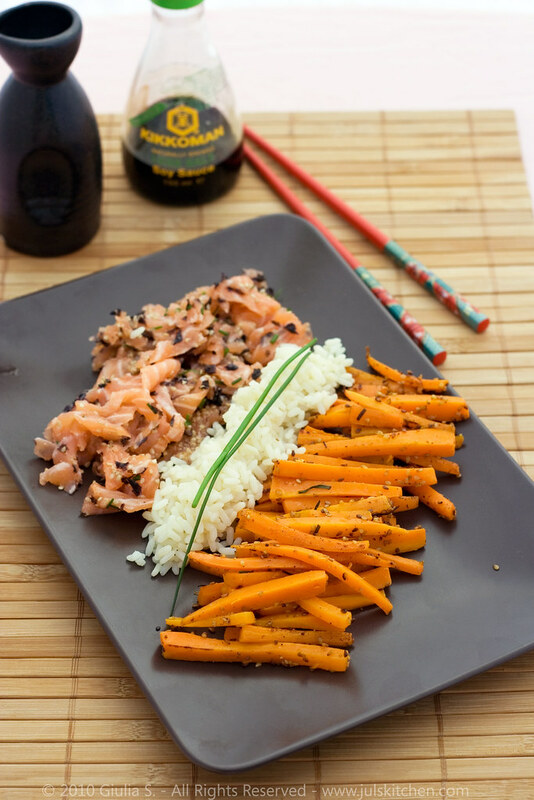 Serve the salmon with carrots, accompanied by the simple boiled white rice. Tasting test. The praise of lightness. To be consistent with my goals I should not say anything else, but … how can I not mention the richness of the salmon flesh that suits perfectly with the slightly acid vinegar carrots and fresh ginger? or how do not appreciate the crispness of Maldon salt, that stands on the softness of salmon and carrots? I made this dish for the first time a month ago, and since then I’ve cooked it at least once a week, conquered by the simple and yummy texture of this salmon. (*) Italo Calvino (15 October 1923 – 19 September 1985) was an Italian journalist and writer of short stories and novels. Beautifully said, your use of English puts mine to shame I think. “Unbearable Lightness of Being” is just a fantasy to me at the moment but love any inspiration how to achieve it. Lovely pictures! Your plating looks amazing! 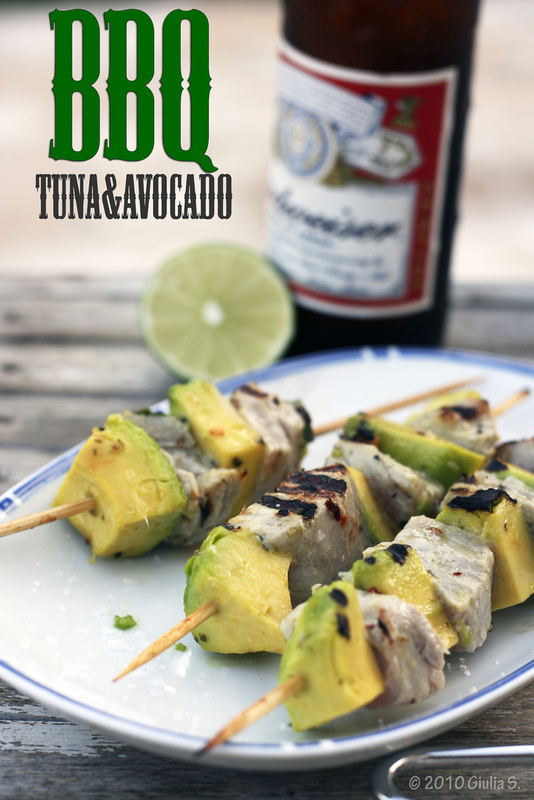 I am too much of a wuss to prepare raw fish myself, but this looks delish! I am definitely scared to serve raw fish myself, but I love this! It is so beautiful on the plate! A wonderful meal! Light and flavorful. I try to eat dishes of that kind on a regular basis. That looks absolutely delicious. There’s something about a session in the pool that makes you feel so radiant and weightless. Every time i hit the water I close my eyes and dream I was a mermaid lol I know it’s so silly! You’re post was very inspiring. I try to keep my life as light as possible as well, though we all know it’s difficult!! Keep up the positive thinking we could all use some more of it! yumm this looks like it would make a fantstic weekend brunch dish.